Our night in Anlong Veng, Cambodia was interesting. It sees very few tourists passing through, much less staying overnight so there is very little in the way of infrastructure or comfort available. We ended up in a cheap hotel where I could no longer keep brushing aside cockroaches and bugs before Sasha saw them. It has been an ongoing thing that I keep distracting her or taking care of problems before she ever sees them and then telling her after the fact about her near misses. Not so this time. There may have been some screaming in the bathroom as the walls came alive.... hahaha. 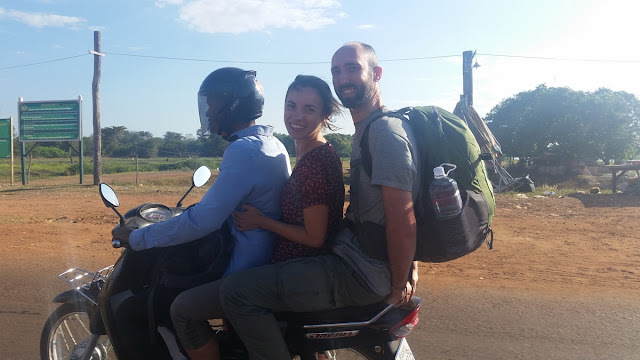 In the morning, Sasha, Bre and I got on the back of motorbikes again for the 15km ride to the Thai border at Choam. This is a remote and rarely used crossing. Even though it seems there is a road going to it and it makes sense to use there is no regular transport to or through it. In researching the routing I was able to find very little about this crossing online since it seems almost nobody does it. I knew it existed and would be an interesting challenge and my gut told me an adventure was calling. Bre was probably shaking her head about me up to my usual antics and Sasha was probably wondering why she still travels with a madman, but based on my past experiences in Thailand, my plan made perfect sense. It was a beautiful sunny morning, it is safe, the people are ridiculously friendly, within a few vehicles passing by we were bound to get a ride. Sure enough, within a couple km, we started passing by some side roads and there was a bit more traffic and we were picked up quickly. We hopped along on short rides, one following quickly after another. 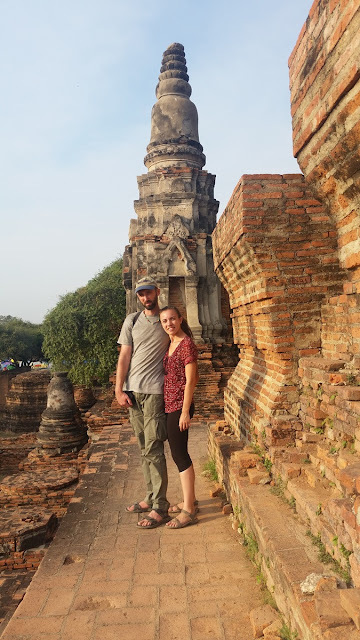 I don't know where we were going but if we had lots more time we could have gone to people's homes, or thai boxing matches or any of a number of other things we were invited too. This is what I love about Thailand and why it is still such a great country to visit. Despite being one of the most visited countries in the world, it is still quite possible to safely and easily get away from everyone else, and the locals will still act happy to see you. 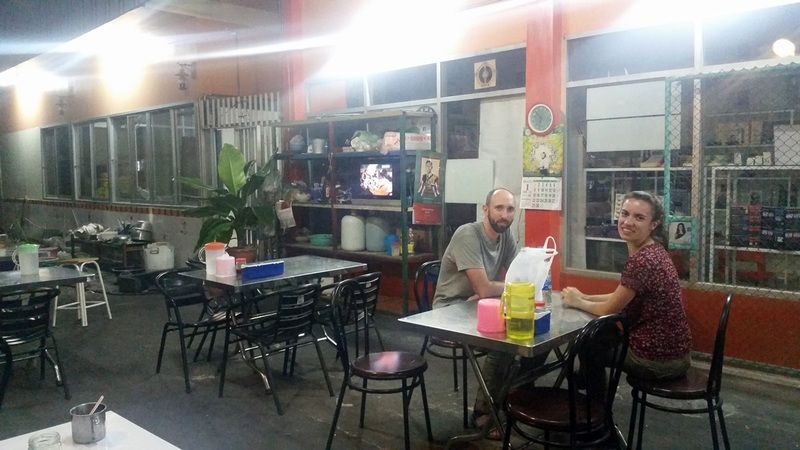 You don't have to worry about the language barrier when people are genuinely willing to help, the food is always good and there is always somewhere to stay. I'm a fan of the unique architectural style too. 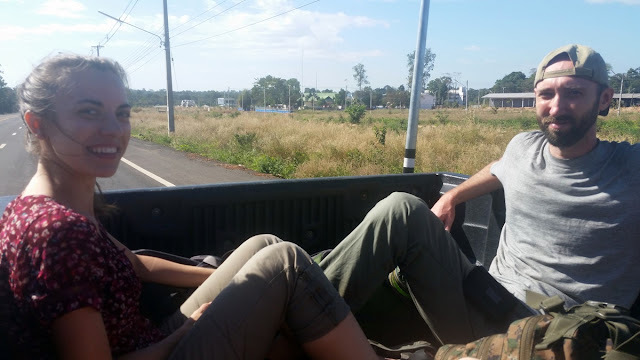 After the touristy chaos of Angkor Wat, there was something very refreshing about riding down back roads in the back of someone's pickup truck just letting travel happen. We ended up in a small town, got some money, got some food and jumped on a random bus that was going to Khorat. I knew where that was at least and it was a step in the right direction. I don't know what kind of bus we ended up on but I feel like it took hours longer than it should have and we arrived in the evening, too late to continue further. I had hoped to catch a train, but the lady at the ticket office was kind enough to point us in the direction of a cheap hotel for the night. The following morning we caught a train to Ayutthaya where we stayed another night. 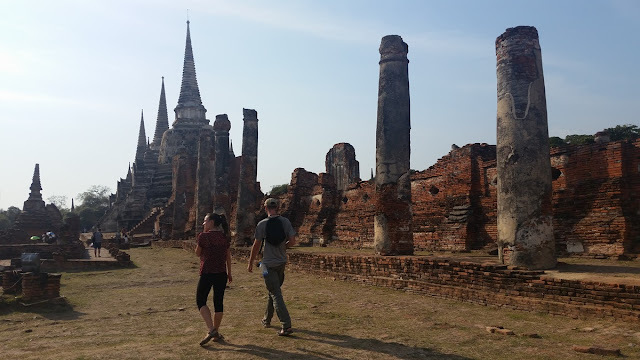 I'd been to Ayutthaya before as well but once again didn't recognize it. I think I'd gone through it too quickly and was too tired back then for it to stick rather than it having changed as much as Siem Reap. It is the site of a former capital of Thailand from the 14th to 18th centuries and has many ruined temples and palaces to see. 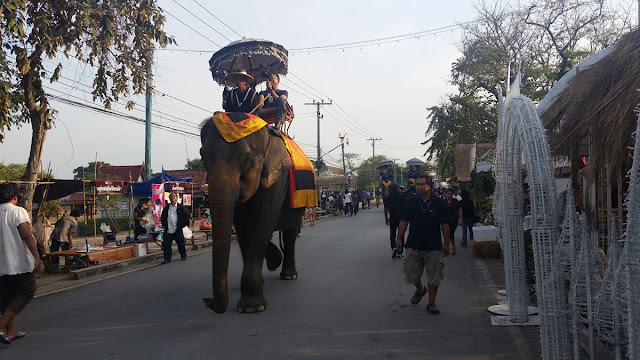 It is a popular day trip from Bangkok and if time permits, highly recommended for at least a quick visit. We wandered around well into the evening and must've pushed it too hard. I had pretty bad heat exhaustion by the end of the day. Remember to drink enough in the tropics! The next morning we took the train to Bangkok for what would amount to a day visit before flying out early the following morning. With only a day in Bangkok the typical thing would be to visit the Royal Palace and Wat Pho. Which we did, sort of. After a quick ride on the river ferry from near the train station to the palace area we realized our mistake. It was a day of funeral processions and mourning for the deceased King. There were thousands of people dressed in black coming to pay their respects. Streets were blocked off, security was crazy and only part of the Royal Palace was open. This was all in addition to the usual heavy tourist traffic. We went anyway since we'd come that far. Wat Pho was a little less crazy but still very busy. It sits in its own large walled off complex beside the Royal Palace area. It is the main temple in Bangkok now and is the home of Thai massage. The style and look are very similar to palace next door (it is hard to distinguish between them in a random photo) but with a lot more Buddhas, including a huge reclining one in the main temple section. All this effectively killed most of the day. I've never been a big fan of the touts and hassle in Bangkok though so I wasn't sorry to leave and head to the airport. Bre flew home while Sasha and I continued for a special next destination on our whirlwind trip.